When a friend orders coffee just as it is and drinks it black, you might get a little suspicious. You might think that they are tired and do not want to dilute the caffeine or perhaps that they have a little bit of a caffeine of addiction. Among these suspicions, you may make inferences like that the coffee-lover is working too hard and that is why they are tired. What you probably don’t think of first, however, is that your friend may be a psychopath. Think again. A recent study suggests that people who like drinking their coffee black are more likely to be psychopaths. Of course, the study also showed that people with personality types like being agreeable have their own food preference tendencies as well. For example, people who enjoyed sweet flavors were more likely to be agreeable. Although the study offered interesting findings, it does have several flaws and should be viewed cautiously. One of the major flaws was that the data was self-reported. Few people are accurate when assessing their own personality traits, though. Further, many people label their personalities based on how they feel at the moment or based on recent experience rather than their on their consistent traits throughout life. Taste is also very subjective, as many people disagree over which foods taste “bitter” in the first place. The study makes the assumption that foods considered “bitter” taste bitter to everyone, which simply is not true. Defining each item’s flavor objectively is not really possible. Study subjects may also misunderstand the question, reporting the intensity of flavor over their preference of flavor. This leaves plenty of space for erroneous findings. Simple personality traits are not sufficient for a diagnosis of psychopathy and people untrained in the field should not attempt to label people with mental illnesses. People should certainly not be labeled psychopaths based on their taste preferences of how they like their coffee. It can be fun, however, to make note of how personality traits and preferred tastes can be aligned at times. The study was based on self-reported personality traits –none of which were labeled “psychopathic.” Having certain personality traits does not make a person a psychopath. Psychopaths are defined by their lack of a sense of ethics or morals. They are a danger to society because of harmful actions they take without concern for others. Many people have personality traits like these at times or in certain combinations. They are not all psychopaths. Further, many people feel this way about themselves (like believing that they are selfish) but do not act accordingly. 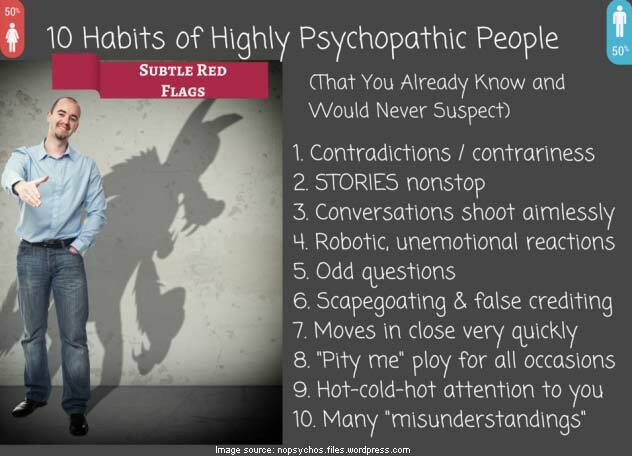 However, when a person has traits like these consistently and acts upon these traits, they may very well qualify as psychopathic. A person whose lifestyle is based upon these sorts of traits may make plenty of money and appear successful. They might never get involved in criminal activity. However, due to their shallow emotions and selfish behaviors, most psychopaths cannot retain long-term relationships and may take large, devastating risks as a matter of impulse. As the case study earlier suggests, there are some indicators that psychopaths have certain things in common. Black coffee being preferred by people with personality traits suggestive of psychopathy is just one example. Other examples include habits like rarely apologizing. Most people think that someone who rarely apologizes is simply selfish or prideful. Not apologizing can be a sign of never recognizing oneself as wrong, though, and that is a characteristic many psychopaths have. Another unexpected sign that someone is more likely to be a psychopath is jumping ahead in line. Psychopaths put themselves first without regard for others as a matter of course, so waiting in line makes little sense in their way of thinking. Inconsistency is yet another example. Like black coffee drinkers, not everyone who is inconsistent has psychopathic tendencies. Some people are insecure, flighty, or even just too busy to behave consistently. In other cases, though, inconsistency occurs because someone with psychopathic tendencies changes their ways in order to get what they want. This type of behavior is manipulative. People with childhood trauma are also more likely to be psychopaths. This is largely because trauma at a young age can cause the mental disorder because of how it can impact development. If you are out with a friend and they order coffee black, you might now think “they are a psychopath.” It’s probably best not to make the assumption, however. If you notice that the person has other symptoms of psychopathy, however, you should begin to set boundaries. Be on guard, as well, as psychopaths often take advantage of others.